Studies of the prevalence of Alzheimer's disease and other dementia in the United States estimate that 14% of those over age 70 are affected, and that prevalence increases with age, exceeding one-quarter of persons over age 80. The implications of population aging for increases in older persons with dementia and the impact on families, which will be the mainstays in caregiving, have been recognized worldwide in a 2012 World Health Organization report on Dementia as a Public Health Priority, and in the United States by the National Alzheimer's Project Act of 2012. 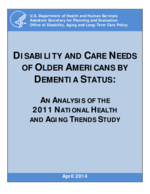 This report uses the National Health and Aging Trends Study, to describe late-life disability and care needs of older adults with dementia. Using a dementia classification developed previously, we examine patterns for older adults with probable, possible and no dementia in the extent of activity limitations, receipt of assistance, and caregiving resources. Our results underscore the disabling effects of dementia and its substantial role in late-life disability and caregiving to older people. Among persons not residing in nursing homes, 78% of persons with probable dementia, compared with 42% of those with possible dementia and 18% of those with no dementia, received assistance with self-care or mobility activities or household activities for health or functioning reasons. Among persons 85 or older, 92% of those with probable dementia received assistance with at least one of these activities. Less than half (44%) of persons in this age group with no dementia received such help. The concentration of assistance among persons with dementia means that those with probable dementia account for almost one out of three older persons not residing in nursing homes who receive help with self-care, mobility or household activities for health reasons. The impact is even more striking among those at more intense levels of assistance--persons with probable dementia account for almost half of the 2.7 million older adults receiving help with three or more self-care or mobility activities. Among persons not in nursing homes who received assistance, those with probable dementia were more likely to live in supportive care settings (about one in five), and to be low income, non-White, and widowed, than those with no dementia. Nearly all (95%) persons receiving assistance with any activity had unpaid help, regardless of dementia status. One-third of informal caregivers were assisting someone with probable dementia and two-fifths of all hours were to persons with dementia. Persons with probable dementia were more likely to have both paid and unpaid help, and total hours of assistance (from non-staff paid help or unpaid help) were more than double that for persons who received assistance but had no dementia. High percentages of caregivers reported positive aspects of caregiving regardless of whether the recipient had dementia. Caregivers to persons with probable dementia experienced more negative effects from caregiving, however--18% indicated a substantial negative impact and another 31% indicated some negative impact compared to 6% and 25% respectively for caregivers to someone without dementia. Caregivers to persons with probable dementia were more likely to use some caregiver support services (respite, training, financial help) but also were more likely to be looking for support services. In general, use of formal support services was low among all caregivers.